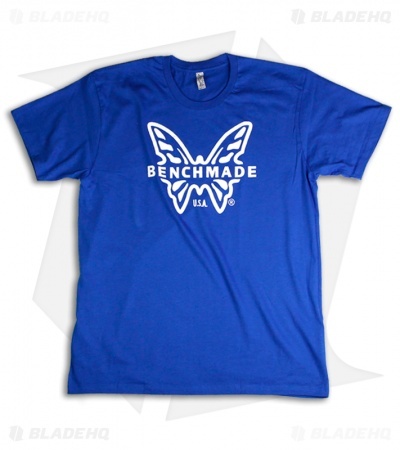 Benchmade blue short sleeve classic t-shirt with white butterfly logo on front. Made from 100% cotton. Available in M, L, XL, 2XL (Choose your size from the drop down menu above). Right out of the box (tube) this shirt had a weak and sagging neckline. The elastic is weak and not able to hold its shape, even before wearing for any length of time. I very rarely seek out a logo'd piece of clothing...pretty disappointed. Centering and action was spot on though. Great Shirt and Outstanding Service! I bought this shirt and the blue Benchmade shirt for my son who is currently at Parris Island for Marine Corps Basic Training, so I can't comment on how he likes them yet. I don't know why he wouldn't, Because I'm thinking about buying some for myself. The other reason I'm writing this review is because I ordered these shirts on Aug. 5 and received them on Aug. 8. Three days from Utah to Ga. Imagine my surprise when I reached in the mailbox and found a package from Blade HQ! Thanks for having these in stock, I haven't been able to find them in stock in the size I needed anywhere else. Thanks Blade HQ for the outstanding service!